Tone 5 is a day of Empowerment. At the Center of the Cube is the Force of Intelligence, organizing and managing the resources, substance, and knowledge for application. Tone 5 gather’s all the resources together to empower the last steps of our climb toward Spiritual Growth. Earth/CABAN represents Mother Earth as the Source of everything Human knows. Earth was the Gift of Living Beauty given to Human by the Creator, so we might experience Life where Love can Grow. Her movement creates the Time for the Experience. Earth/CABAN offers the Living Demonstration to Move Forward with Passion, Love, and a Divine Purpose. The Cherokee Heron is the nahaul who carries out life as a perpetual migration. The Heron is always moving away from the Abundance it finds to reach a Greater Blessing. Heron is also the symbol of the Phoenix who rises from the ashes of its past. CABAN encourages us to Reach for Higher Meaning and Purpose with all our Heart. Earth/CABAN keeps us moving on, beyond our status quo. We are guided to see Abundance as a Gift that will continue to Multiply to even Greater Abundance as we keep moving on. N’oj is the K’iche Day Sign that represents the Human capacity for Knowledge. The N’oj glyph illustrate 3 minds of Consciousness – the Human mind, the Spirit mind, and the Mind of the One. Through the two Sources of Spirit from Above to Below, the thoughts of Human rise to Divinity. N’oj is the Divine Eye. Like the Eagle is constantly adjusting it’s vision. We can consolidate Human and Spirit Consciousness, like the muscles of One Eye, using them in perfect synchronicity, we’d see clearly even beyond darkness. We were never expected to arrive at our Highest Accomplishment. Human was meant to always be Creating. Creating is a Communion of Spirit. All our capabilities of Consciousness are Divine. When we are mindlessly manifesting a creation, we’re expressing a Communion of Spirit that engages our Whole Mind together in a State of Unconditional Love, a State of Personal Freedom of Choice. We’re trying to express something the way WE see it, as an experience that can be shared that’s like no other. OLLIN offers a foretelling that this is a day to follow our own path and our own Truth. We’re not supposed to just “go along.” We were shown the Wisdom to make Wise Choices. Now that we know how, Wisdom is ours to employ. The Ascended Ones shared a way to follow our own Wisdom, and to Believe in our Truth when we’ve Forgiven. Today, we’re offered a Vision of who we could become with all the Spiritual Tools at our Disposal, and the Wisdom and Integrity to use them Wisely. With this New Vision of our Self, CABAN offers the supporting Movement to Go for it with everything we’ve got. A Dream the Creator promised in our Future has been calling our attention. It is a Dream that seemed so far off we could only see a speck of it. Yet, as Eagle/MEN the speck was all we needed. The Wise Old Owl, CIB, backed it up with the Eyes to See in the Dark. We can now see the Dream both Night and Day. That’s the Sign of a Genius Dream – the one that we can’t stop thinking about, that even pops up in our Dreams. This is a Sign of the Passion for Movement, and the Love for a Possibility of Divine Creation. It may have seemed like the Dream was too far off. But on Earth, there will always be a Sign of forward movement. Today we can see it as clear as Dark and Light. We’re on our way. Seize the Day. We don’t have to complete the journey in one leap. Thank the Creator, we were only given one day at a time. Each day with the Creator’s Light was the Sacred Event we’re given, the One Step at a Time that promises a Divine Destination. Our Divine Destiny is a Place that Overflows with the Abundance of Unconditional Love. We get their as we learn to Love one Experience to the Next. I was called to re-read Ian Lungold’s short biography. I found something new. His path was led from loving one thing to another. He started out from the Beauty he saw in the glyphs. He engaged the Love of recreating them as his jewelry. That was the only end. There’s something magical in engaging all the elements of the calendar as a personal experience. He felt the Vibration and “CHICCHAN” that Tzolk’in followers share as a common experience. The calendar touched him through the glyphs. When he was done, he realized a limitation. He had all this Day Sign jewelry, and no way to identify to whom they would belong. 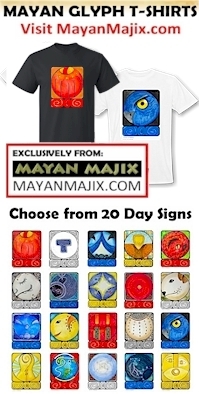 Without a calendar to translate the current date, we’d never know our Mayan Birthday or which glyph to buy. He started with a jewelry project he loved, with no higher intention. Look where the calendar led Ian’s journey, all from a Creation of Love. We can only Dream of the Divine Plan the Creator has for us, just from following ANY Dream we Love. It won’t be our last Dream. One Dream we Love will always lead to a Higher Dream. There will always be a reason to move on from what we are doing today. To Believe this, you only have to Look at Mother Earth to see how much there is to see and do. If we were stuck on one thing forever, we’d miss a lot of her Beauty. Our Mission is to share our Experience of her Beauty with the Creator. To fulfill our Divine Meaning and Purpose, to actualize the Creator’s Dream, we have to keep moving on. To all my relations, may we turn to the Beauty of Mother Earth. May we look at all her colors, given to be re-arranged in an endless number of ways. Think of the millions of photographs, paintings, poems, and artistic expressions that she’s inspired. We LOVE HER. She’s in EVERY family portrait… either as US, or in the background. When nothing else is in the frame, Her Beauty alone will always engage with our Heart. May we see Mother Earth as the Source for moving forward. She inspires ALL of our Dreams, either through the knowledge we draw from her, or our experience of her Beauty. May we see ALL the Beauty as the Reason for the Gift, a Reason for living that could stand on its own. I’m grateful for fallen snow outside my window and the beauty of the living things that pay a visit there. I’m grateful for Beauty that extends from the closest perspective to as far as Eagle and the Owl can see together. What a wonderful reflection, zo valentine. I have adopted a similar practice of rising with Debra’s reflections on the daily glyph. I read this as I also hold my little Catness domesticated kitty who likes to curl up on my lap as my familiar and muse as I work with the readings here and read of the saving, care and propagation of the Jaguars. Feeling yummy being on the Mothership Earth, honoring the good news and her perpetual renewal. Timely and informative your posts have provided me both guidance and counsel in the fluctuating chain of events that are currently effecting my life. I remain actively seeking change. Thank you for the comfort the Mayan Tzolkin Calendar DayKeeper’s Journal shares. “Always Thanks and Blessings, and Unconditional Love.” Your posts have delivered me from a super difficult place to a place of understanding and acknowledgement of human’s weakness in comprehending our own intentions. It is good to know that we are not alone and that the Ancestors, and agents of Mother Earth and the Creator continue to provide guidance and inspiration.